Honeymoon, San Francisco, Transport - planes, trains and automobiles, Travel - bon voyage! San Francisco buzzes with life, the clang of cable cars and the revving of vehicles making some of the most difficult hill starts in the world. Down at the port, sailboats and ferries and tugs and ships all come and go, depositing passengers and collecting new ones whilst barking seals bask on floating platforms at Fisherman’s Wharf and the City’s renowned wind whips its way around corners, flapping awnings and flags on its way. 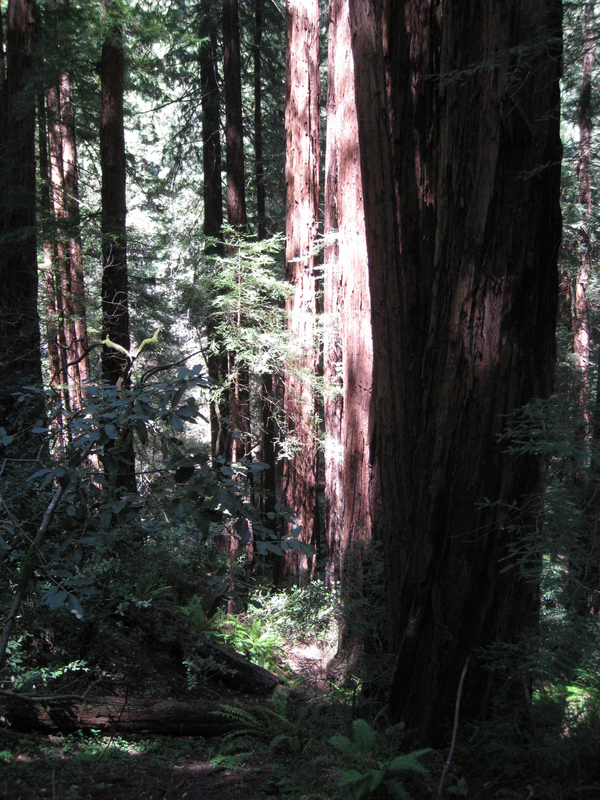 Yet just 12 miles north of the busy Bay Area metropolis lies an area of complete tranquillity called Muir Woods. I first visited this natural monument many years ago as a teenager, and now was about to return, newly married with husband in tow. Monsieur had been to the Bay Area before this, but hadn’t yet visited Muir Woods, which understandably boasts the title of ‘National Monument’. 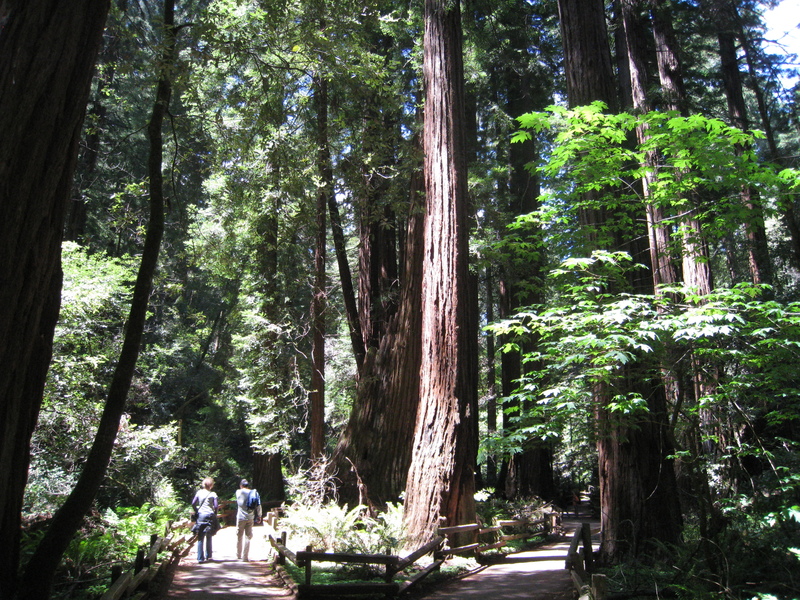 Muir Woods was declared as such by President Theodore Roosevelt in 1908, by which time this area of towering Coastal Redwood trees contained but a fraction of California’s original number, which once spread across a staggering 2 million acres of old growth forest. That was before the logging industry came and cleared most of trees away and before the cities were founded and populations grew and wood was needed for building and paper and fuel and furniture. Thankfully, the area in which Muir Woods stands was considered inaccessible, thus saving it from the slaughter of trees taking place elsewhere in the state. Then a certain US Congressman by the name of William Kent and his wife purchased the area that contains Muir Woods, in the interest of keeping the sky-scraping trees safe from the dreaded axe. 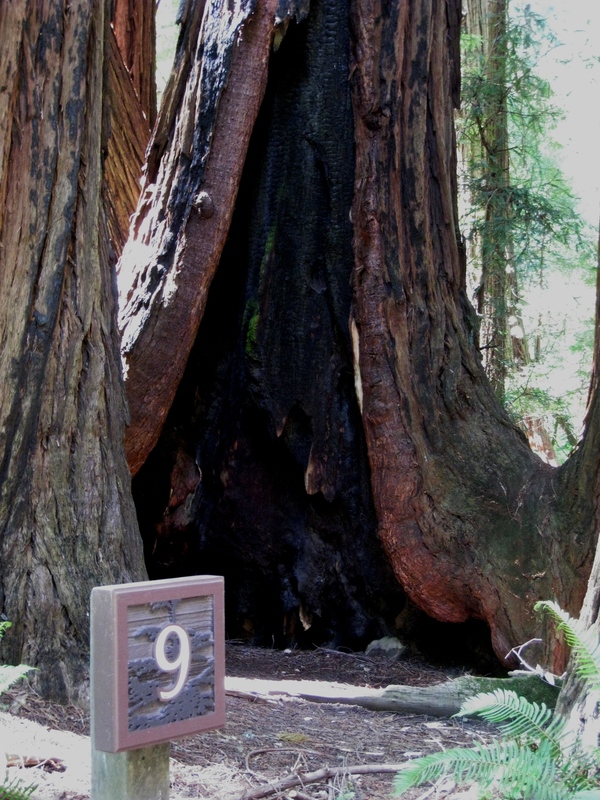 On naming Muir Woods, Kent’s name was initially considered as appropriate, but after a time Kent himself tossed it out in favour of that of John Muir, a naturalist whose work had helped create the National Park System. And so the Woods were renamed in appreciation of Muir. Monsieur and I purchase our tickets at a little hut manned by a bearded man resembling your archetypal log cabin-dweller. I start humming Daniel Boone, then off down the path we wander. There’s no rush apart from that of the breeze stirring the branches above. Before long we can barely see the sky for the amount of foliage above us, the girth of the tree trunks on either side of the path growing ever larger. Chip and Dale’s cousins play in the undergrowth to either side and a Woody Woodpecker can be heard in the distance, his beak pecking away madly with its sound echoing through the trees, but something larger is rustling the ferns a couple of metres away. We follow the movement of shaking green leaves until we spot the source: a young doe foraging for lunch, oblivious to our gawping from the track below. “Quite.” I reply, struggling to remember the reasons myself. 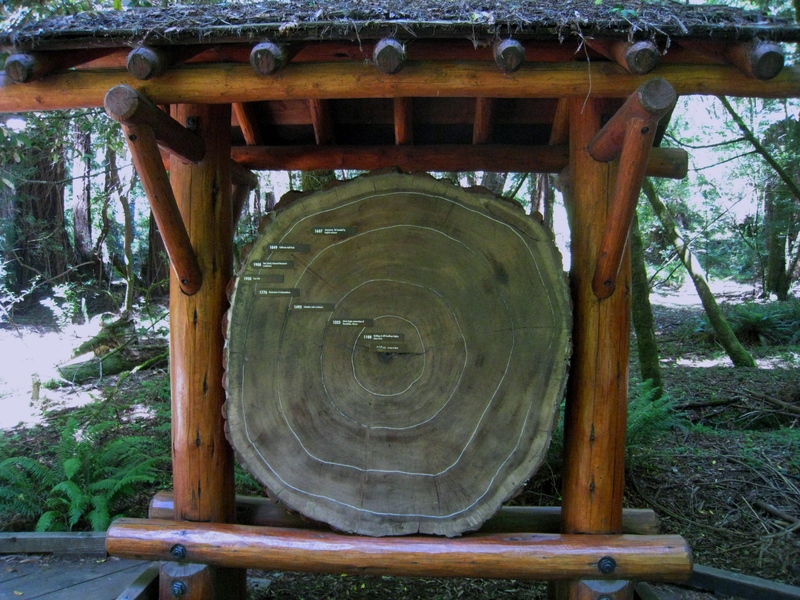 For instance, how much your average redwood needs to drink in a day (up to 500 gallons, a lot of which is drawn from fog), how tall redwoods can grow (115 metres) and the height of the tallest tree in Muir Woods (79 metres and climbing). We also learn that the Coast Redwood or Sequoia sempervirens variety to be found at Muir Woods only grows in a specific coastal climate. In winter, this area will have plenty of rainfall to sustain such giants, but the summers here are dry, so the trees rely on fogs from the nearby sea to provide necessary moisture. 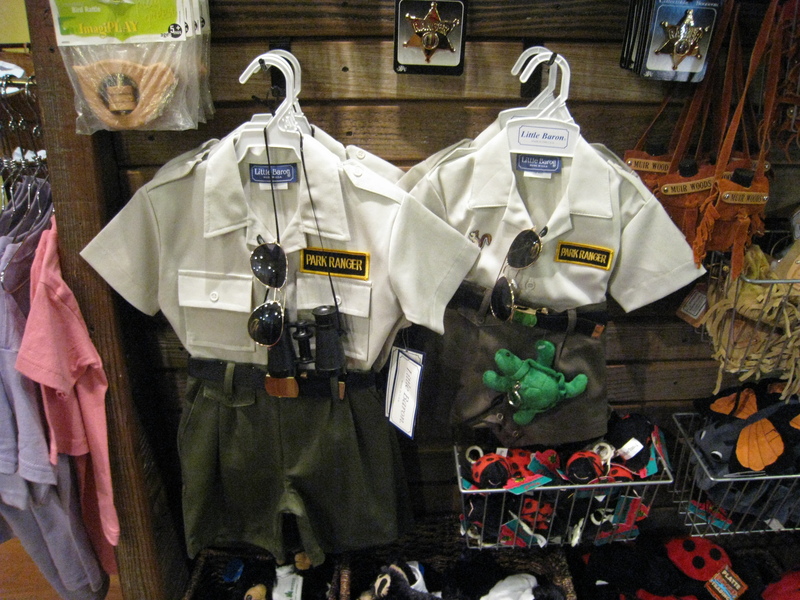 Watching the enthusiasm of the young woman in ranger’s uniform I envy her this job because it matters. Preserving such a beautiful, natural environment is a true vocation. There’s no rat race here. This work counts for something and even on the wettest days of the year, to be tasked with guarding a monument such as Muir Woods, its soaring trees which have breathed and grown as wars were fought and countries formed, its happy fauna frolicking undisturbed about the place, must make getting up each morning a joy. It’s positively Snow White (without the Seven Dwarfs). Ambling along the pathways we find several redwoods with burn marks on their trunks. 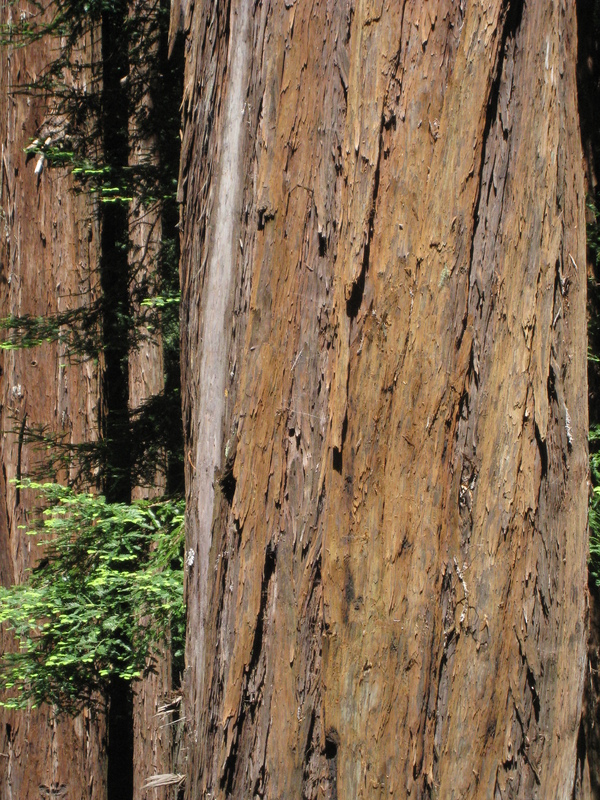 We know from the ranger that redwoods don’t burn easily, thanks to fire-resistant tannins in their composition, which is why these scorched trees are still standing tall today. Next, we pass through the aptly-named Cathedral Grove, where some of the tallest trees in the Woods are gathered, soaring skyward as might the columns of a Gothic cathedral with a leafy canopy for its ceiling. Then we cross the burbling Redwood Creek to climb up to a higher path. I feel my heart rate slow, such is the peace all about us, and inhale deeply. 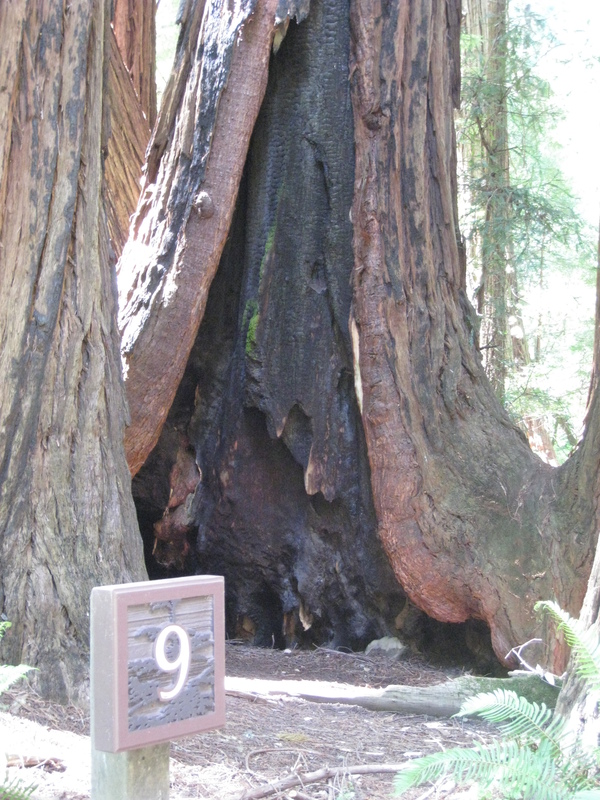 The aroma of redwood trees is all at once fresh and spicy and warm and I want to sear the scent into my memory. Is the Cathedral Grove named because there is a semi-circle of a halfdozen redwoods looking very churchy? I love your narrative filled with deserving wonder and awe. John Muir was essential to Ken Burns recent eight part series on the National Parks and he cited a hilarious 3 day camp-out with Theodore Roosevelt (when he was President btw) and John Muir where Mr. Muir basically told TR (a famous hunter) that hunting animals was uncivilized! 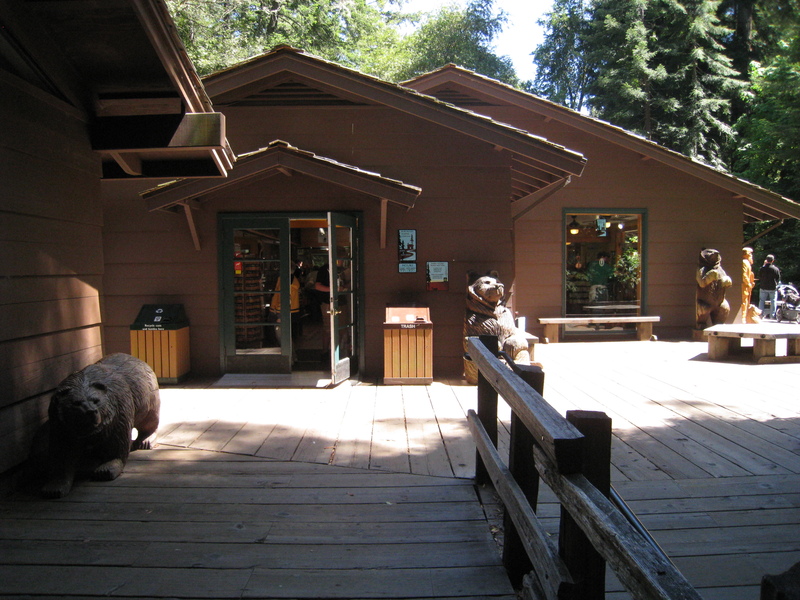 I love the Muir wood and I try to visit it each time I go to San Francisco. I can think of two consolations for living in London. Those trees are magnificent! So beautiful and worth watching over. Oooh I get so excited when I return to the blogosphere and find all sorts of interesting comments! 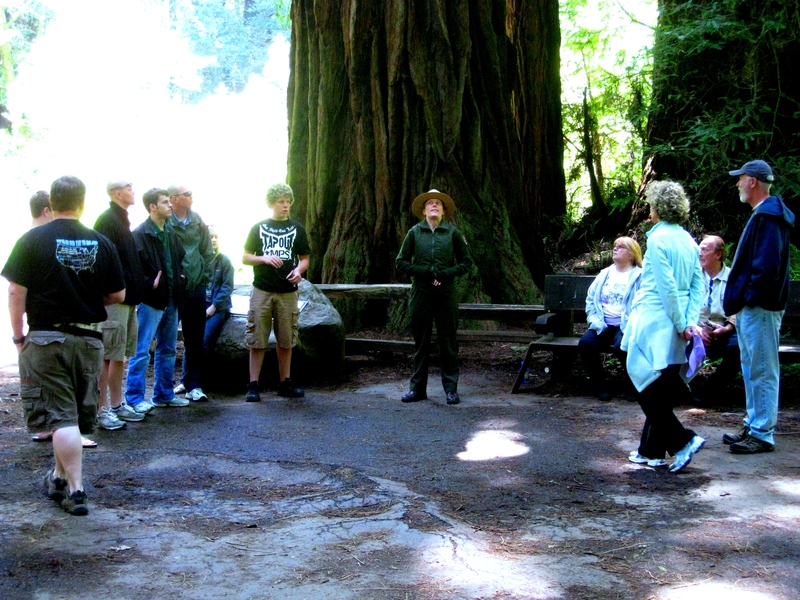 Planetross – I believe you are correct about Cathedral Grove, but what, no double entendres or puns in your comment? I’m sure you must have hidden one in there somewhere. Pat – I’ll keep an eye out for that series – sounds like a good’un and would love to learn more about your national parks. Wouldn’t you have loved to be a fly on the tree when Muir told Teddy R that hunting was uncivilised? Good on him. From what I hear of TR, he would have taken it quite well I think. Razz – aha! Another thing we have in common – a love of Muir Woods! Fantastico. And yes, we’re lucky not to be in an earthquake zone here, although that Icelandic volcano with the long name is enough of a natural threat for me. You’re right about being close to Europe, too. I do love it. Getting itchy feet and planning next adventure! S Le – absolutely correct about the trees being magnificent. That’s a totally apt word for them because they are so mammoth in size and beautiful to be around that only a word like ‘magnificent’ will do. Thank you. 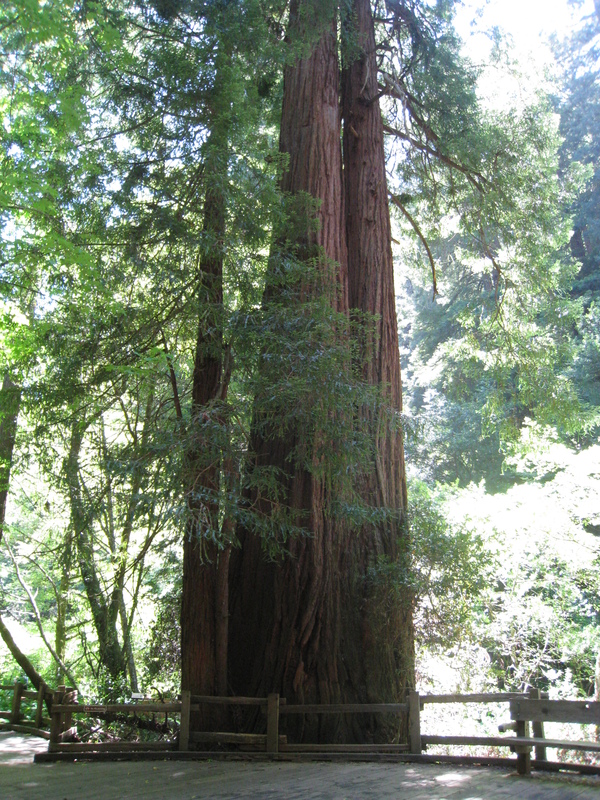 I was raised in California and loved Muir woods. I miss it still. Even my Ashley, 7 yrs old, says its magnificent. Lisa, thank you for your comment. Muir Woods is certainly a magical place and I hope I’ll be lucky enough to go back again one day.